TheLEADERNational Assembly Chairwoman enjoyed the highest rate of "high confidence" which was 90.1 per cent whilst Education Minister fared the worst in a vote of confidence held by the National Assembly yesterday. The result of the votes of confidence for 48 officials holding positions elected and approved by the National Assembly was announced during the sixth session of the 14th National Assembly. Meanwhile, 81.03 per cent of deputies gave Prime Minister Nguyen Xuan Phuc high confidence votes and 14.2 per cent cast confidence votes in him. Vice President Dang Thi Ngoc Thinh earned a “high confidence” rating in 66.5 per cent of voters and “confidence” of 30.1 per cent of voters. Speaking to the press on the sidelines, Education Minister Phung Xuan Nha said the low score would serve as "motivation for me personally and the entire education sector to improve ourselves and have more robust solutions" to address the long-standing issues facing Vietnamese schools. The confidence vote serves to “enhance the effectiveness of the NA’s supervisory functions as well as the government’s,” said Tran Van Tuy, Deputy Chairman of the Parliamentary Affairs Committee. This vote has only been held three times so far, the other times in 2013 and 2014. The vote, a secret ballot, has three types: “high confidence,” “moderate confidence” and “low confidence.” The members of parliament can choose one type of vote for each member in a pool that consists mostly of members of the executive branch of the government. This year, the pool contained 50 names in total, but the president and the information minister were not eligible to be voted on, as they took their positions very recently. An official has to hold his/her position for at least nine months to be voted on. If an official gets “low confidence” votes from more than 50 percent of the voting delegates, it is recommended that he or she resigns from his/her post. This year, there was no such case. Commenting on the voting criteria, NA delegate Vu Trong Kim said an official with high rating would need to do their job well and their lifestyles be “pure” and “humble.” Delegate Truong Trong Nghia said he looks to how much an official has contributed to their relevant field after assuming their positions. “If you have been in your position for several years and nothing has changed, you don’t meet the requirement,” Nghia said. 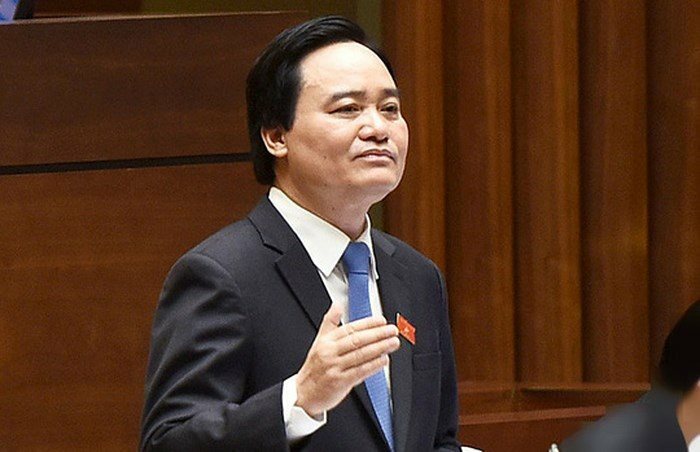 Other Government members suffering from low rates of "high confidence" include Nguyễn Văn Thể, Minister of Tranport; Nguyễn Ngọc Thiện, Minister of Culture, Sports and Tourism; Lê Vĩnh Tân, Minister of Home Affairs; Phạm Hồng Hà, Minister of Construction; Nguyễn Chí Dũng, Minister of Investment and Planning; and Chu Ngọc Anh, Minister of Science and Technology.